However, a Pew Research Center survey conducted in March found that five of six publics in the region were opposed to both Western and Arab governments sending arms and military supplies to anti-government groups in Syria. The opposition to military aid from the West is particularly strong in Lebanon where 80% of the total public and 98% of Shia Lebanese do not want the West to get involved. 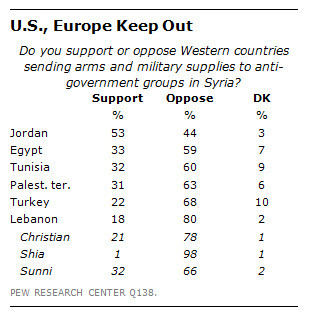 In Jordan about half the population (53%) supports American or European military assistance for the Syrian opposition. At the same time, there is no public support in the U.S., Western Europe or in Turkey for sending arms and military supplies to the anti-government groups in Syria. Eight-in-ten (82%) Germans oppose such assistance, as do more than two-thirds of the French (69%) and the Turks (65%) and a majority of the British (57%). Nearly two-thirds (64%) of Americans were also against arming the rebels when the survey was taken in the first two weeks of March.